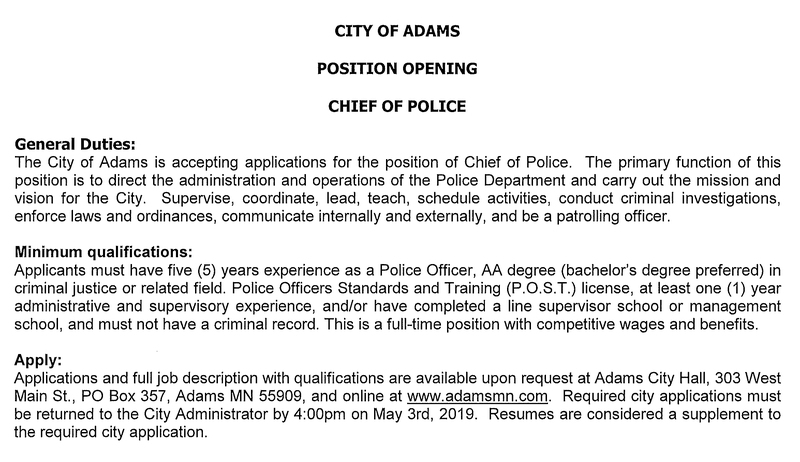 ​The City of Adams is accepting applications for the position of Chief of Police. The primary function of this position is to direct the administration and operations of the Police Department and carry out the mission and vision for the City. Supervise, coordinate, lead, teach, schedule activities, conduct criminal investigations, enforce laws and ordinances, communicate internally and externally, and be a patrolling officer. The City of Adams is currently looking for an experienced, results oriented Licensed Nursing Home Administrator . A dynamic leader who can drive Medicare census and promote and support teamwork, service, quality care and resident satisfaction. Copyright © 2019 City of Adams, MN. All rights reserved. Contact Janet Stephenson at jstephenson04@gmail.com for questions, corrections, and/or suggestions regarding the website.